I have been looking through a ton of pins on Pinterest and one thing that keeps standing out to me is the natural wood pieces. I have been on a painted furniture kick for a while but I really like the balance of wood tones with painted pieces. 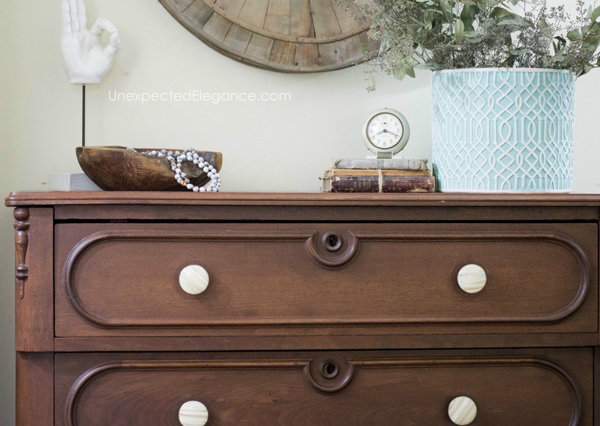 I only have a handful of stained pieces of furniture, so I was so excited when I found this antique dresser! It is the perfect dimensions for our upstairs hall and only cost $55. I found it at local antique shop a few weeks and it really only needed minimal work. Below is the before picture. 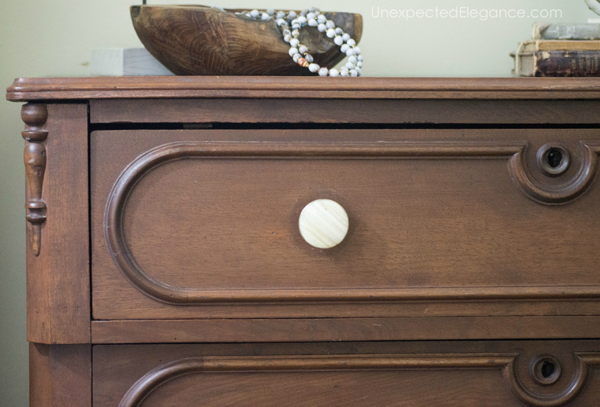 The knobs were out of date, but the wood is a beautiful color. Not too dark, not too light, not too red…but just right! 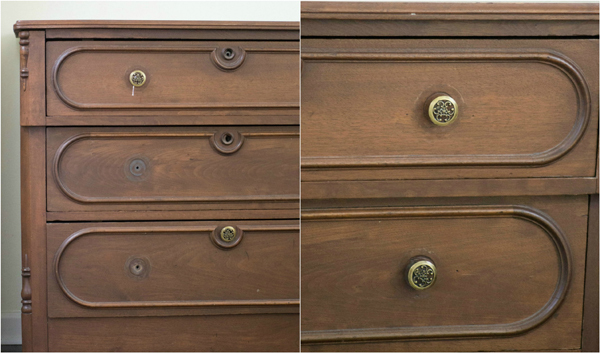 I literally only had to clean the wood (it was a little dusty) and replace the knobs. The details are simple…my favorite! I found the knobs at Hobby Lobby on sale for $3 each, so I only spent around $75 total. 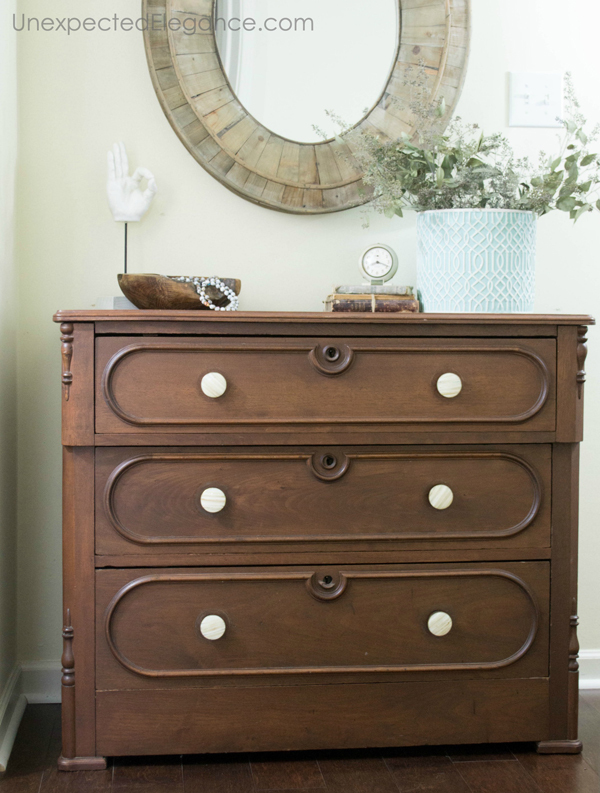 I have to say this is the quickest and EASIEST furniture makeover I have ever done. 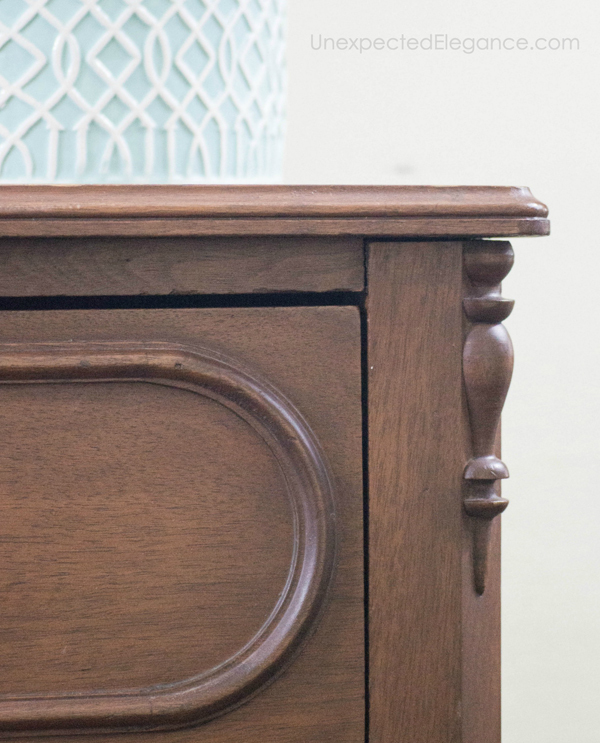 It’s amazing how a few new knobs can completely update a piece. What do you think? 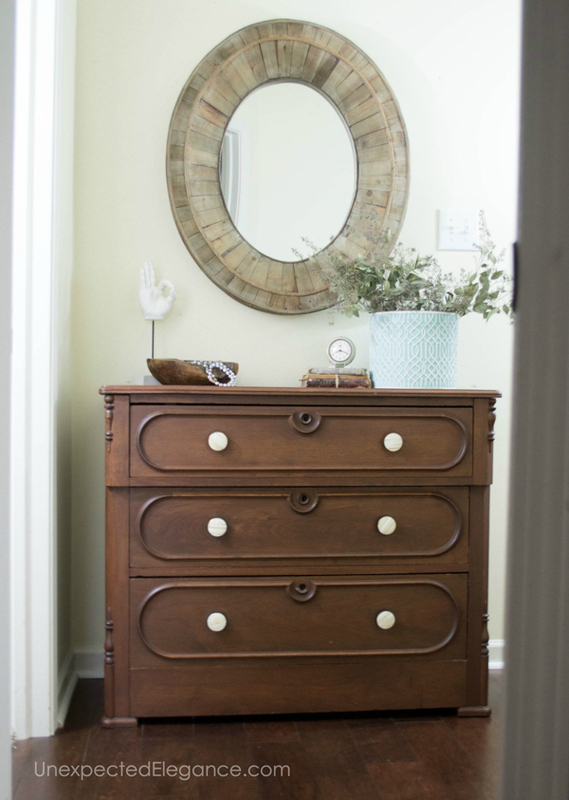 Love it, the knobs are such a perfect touch. I think it’s a BEAUTIFUL dresser, Angela! and it looks like it was made for that space! Your ad that won’t go away is VERY annoying!! You can’t focus on your post because of it. I’m so sorry! I just went to the post and nothing is popping up for me. Was it over the pictures or banner ad? Very nice find! Looks like solid mahogany rather than veneer, pretty rare. I’m so glad you decided to not paint it. I worry a bit when I see a true antique ruined by paint. There aren’t many antiques left, but it looks as if you found one! It’s a beautiful accent piece, just as it is. Jana, thanks! It is beautiful! !